The last time we were in the Broughton Islands was in 2011. The weather was awful, time was short, and our boating skills were limited. This trip the weather was spectacular, we are more confident boaters and we took full advantage of the southern area of the Broughtons. Because the weather was so nice this year there were definitely more boats cruising and sailing the area than four years ago, but it didn’t feel “crowded” at all. The Broughtons include fjords that stretch for 50 miles, plus channels, bays, hills and mountains that are 99.99% undeveloped. There are very few houses, almost no roads, and when people travel, they travel by boat, seaplane or (rarely) helicopter. 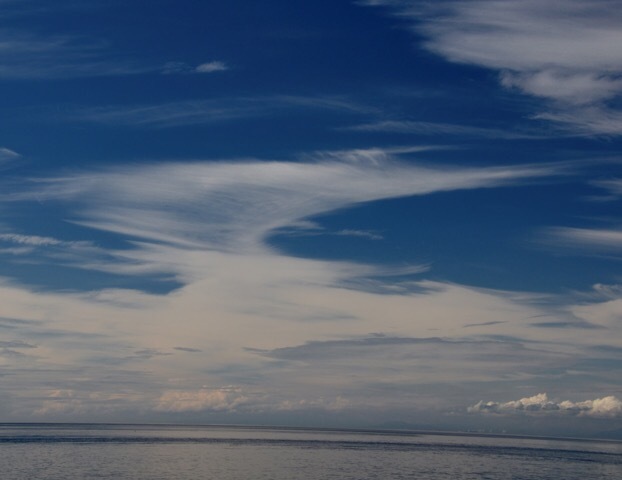 As the Captain said: “the physical world here is divided primarily into only three things: the sea, the forest and the sky. And on that beautiful backdrop, there are eagles, osprey, dolphins, whales and, at low-tide, black bears and grizzly bears looking for crabs and clams on the exposed rocks and mud flats. 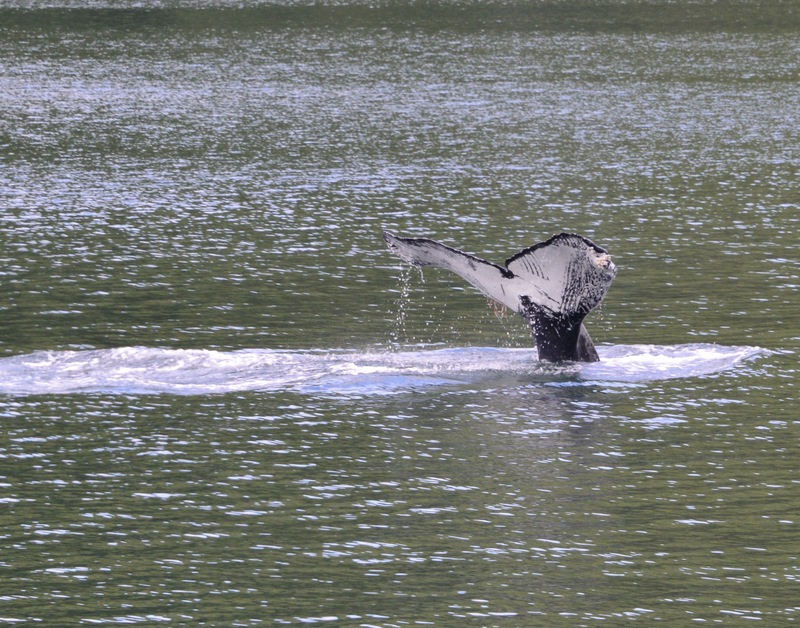 As we cruised up Tribune Channel, we encountered our first whale of the trip. 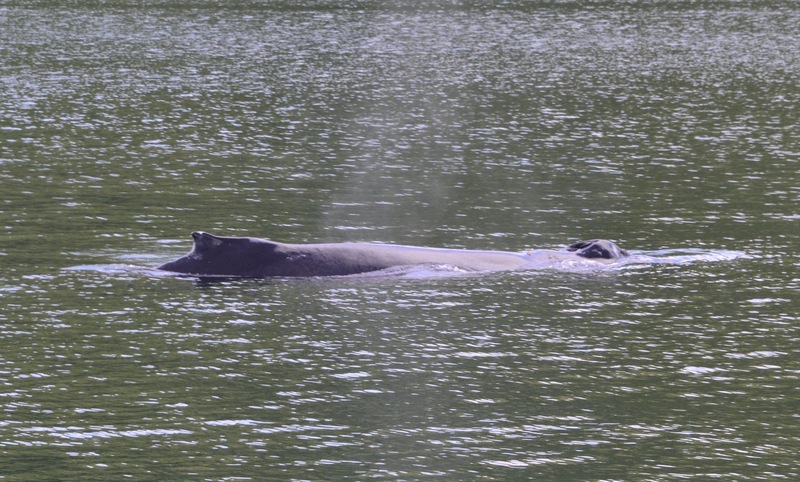 We’re pretty sure it was a humpback whale so we named it “Wanda.” Little did we know that we would have the opportunity to spend a lot more time with Wanda only a few days later, and only a few miles away. On our second night in the Broughtons we decided we needed to stop someplace with internet so that meant a night at one of the wilderness marinas. 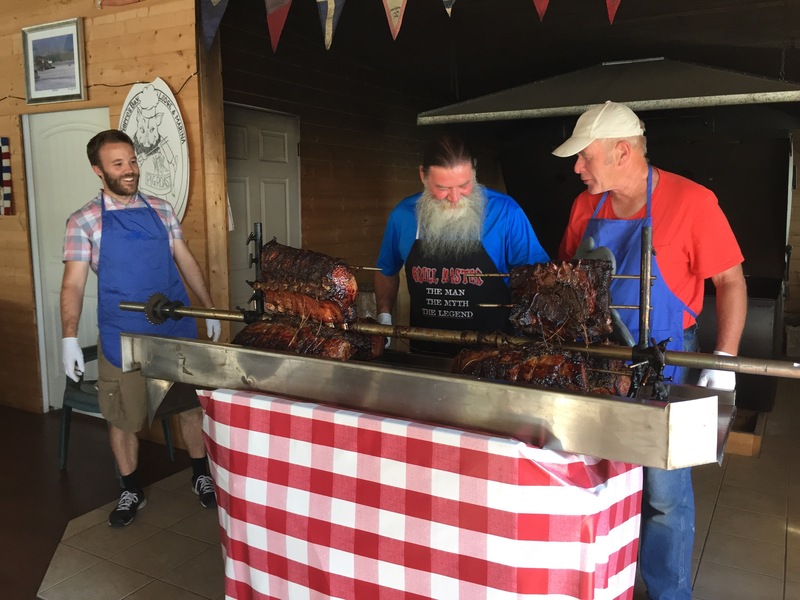 So we stopped in at the Echo Bay Marina and got the last open dock space just in time to share the marina’s amazing prime rib dinner with about 70 other boaters. The owners are truly lovely people. The internet was very limited, but that’s the case almost everywhere in the Broughtons. Cell phone service is also very limited. Amazingly, we happened to sit down for dinner with two retired gentlemen who were in the area fishing – one from Whidbey Island (near Seattle), and the other from Pasco in Eastern Washington. After talking for a bit, we discovered that the one from Pasco grew up in Portland (Oregon), where Jim’s Dad grew up, and that his grandmother’s maiden, name was Spady! She was related to George Spady, who is Jim’s great uncle, so its very likely that we shared a meal with Jim’s cousin, who Jim had never met previously, at dinner. What a small world! Jim and his cousin exchanged contact information and plan to meet again later this summer. Despite our desire to get away from it all we must admit being severed from the collective is very unsettling. While we could get, a satellite internet service for our boat, it’s ridiculously expensive so we’re not planning to do that anytime soon. So we do what we can when we get occasional cell phone service and also check in when we can when we stop at a marina. We realized pretty early on this voyage that we were only going to get to do a little bit more of this vast area than we did four years ago. We needed to pick one of the many long channels to explore this time, so we chose Mackenzie Sound and the Little Nimmo (pronounced “Nee-mow”) Bay Resort. Over most of its history, the Little Nimmo Bay Resort has been available only to people staying at one of the cabins at the resort. But recently the resort opened up its simple but beautiful facilities and restaurant to boaters on a reservation-only basis. It seemed appealing in the guide book, and we were able to get a dinner reservation for Saturday including an afternoon massage and dinner. Cruising to Nimmo Bay took us to an area of the Broughtons that we had never visited before. As we motored towards the resort, the mountains and constantly changing channel views were enchanting. We passed dolphins and eagles as we cruised, finally passing through Mackenzie Sound and the narrow, shallow entrance to Nimmo Bay. This is a magical little spot where the resort owners raised their children, schooling them at a nearby First Nation village (Hopetown) that is now almost completely abandoned. One of those children is now the grown man who is running the resort. He lives at the resort with his wife and children, carrying on the family business. After anchoring and taking a tour of the resort from Brianna (who has worked there for 9 summers) we took the dinghy out to explore the far end (head) of Mackenzie Sound where we discovered that the salt water there was a very comfortable 76 degrees! I couldn’t wait to swim. But I was concerned I couldn’t get back on the dinghy without a ladder. After searching through the dinghy the Captain magically found a little ladder that worked perfectly. So I went swimming in the salt water of the Broughtons! That evening we enjoyed a yummy light dinner of caprese (tomato and mozzarella) salad and some pot stickers before heading out on our dinghy for the best sunset we have ever shared on the True Love: 360 degrees of colorful sky in every direction, beginning with golds and ending with deep reds and pinks. The next morning we headed out to catch some fish and photograph a bear on the beach. Both evaded us but we did take time to play with the dinghy’s new chart plotter and fish finder. The Captain loves this new piece of equipment because it allows him to feel safe as we quickly explore nearby shallow areas at 20 MPH, something the mother ship cannot do. Although the fish and bear were elusive we did have a fantastic encounter with a pod of about 15 dolphins at both ends of Mackenzie Sound. That may be why we couldn’t catch any fish! We stopped for our picnic lunch during our second dolphin encounter and just watched the dolphins play and fish at the narrow, rocky entrance of Hopetown Channel (which was too small at low tide even for our dinghy to pass). According to the manager of the Nimmo Bay Resort, every year at least one large boat ends up on the rocks in this channel because they don’t review their charts carefully and don’t realize their mistake until it’s too late. Our afternoon at Nimmo Bay was spent reading, soaking in the resort hot tub by the waterfall and getting massages. Our evening was spent with 4 other guests enjoying a delicious wilderness gourmet meal and ending with a gathering by the dockside fire pit. There was a father and son from Westchester, NY (small world – that’s where I grew up), and a husband and wife from Victoria. You would have thought after such a full day and a large meal, sleep would come pretty easily. After about an hour of reading when I was still no closer to falling asleep, I decided to go to the top of the boat and look at the stars. The night sky on the water is iffy. Although there isn’t any light pollution, there is usually a marine layer of clouds. But that night was an exception: the stars were glorious and I saw 4 shooting stars (allowing 4 wishes) and a variety of satellites before I headed down to sleep. As I write this summer’s first entry of True Love Adventures we are anchored in Boughey (pronounced “Boogie”) Bay in the Broughton Islands, which are a remote and beautiful group of islands on the N.E. side of Vancouver Island in the Canadian Pacific. Given our longer-than-usual timeline for this vacation, we hoped we would be able to make it as far north as the Broughtons. We’ve made it up here once before, in 2011, but the weather was pretty bad and we didn’t have time to fully explore these islands. So, I was drawn to return to the Broughtons this year, weather permitting. 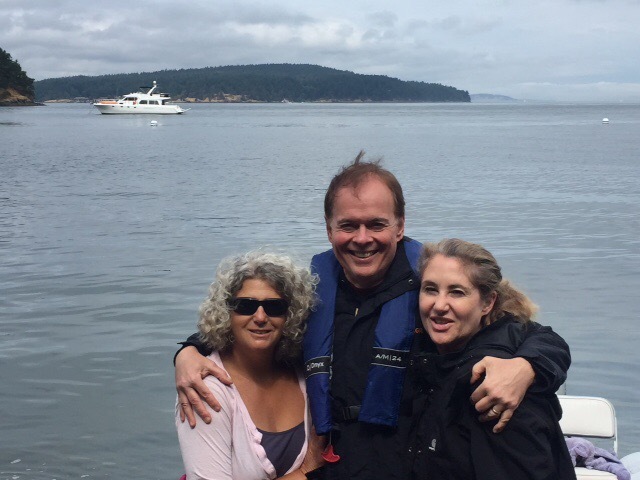 We began our trip north from Seattle with our longtime friends Jeanette and Brett Newman. There is something so special about spending time with old and dear friends. Now that Jeannette & Brett live in Sonoma, we don’t get to see each other often, but our time together was, as usual, easy, calm and authentic. 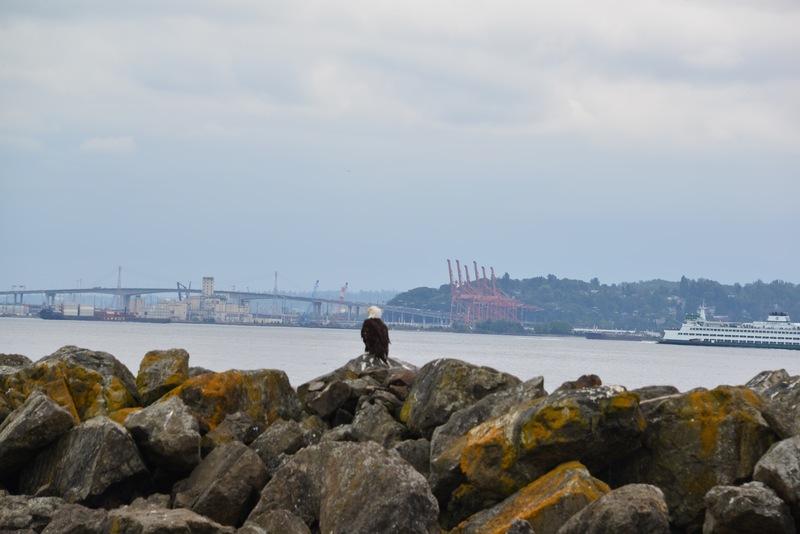 As we left our Seattle homeport, Elliott Bay Marina, on Friday July 10th, an eagle sat on the marina’s outer breakwater as if to wish us a Bon Voyage. 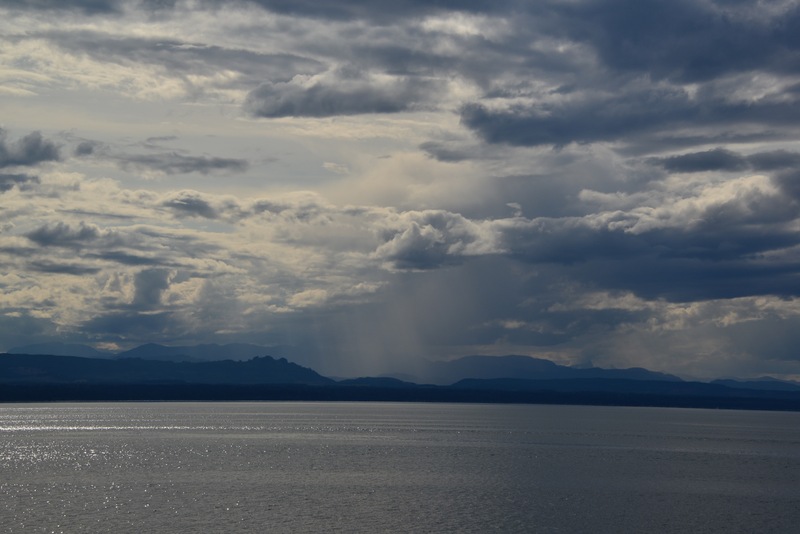 We cruised north about four hours to our usual spot at Fort Flaggler, across the bay from Port Townsend. From there, we took the dinghy into town for a walk and delicious dinner at the Sirens Tavern before returning to the True Love for a pleasant evening of conversation. The next day (Saturday), we had an easy, although somewhat foggy, passage across an almost perfectly calm Strait of Juan De Fuca to the San Juan Islands. We anchored at Turn Island, just outside of Friday Harbor. We hadn’t anchored at Turn Island for at least 15 years. That was our first “cabin cruiser” experience when we borrowed Jim’s brothers’ old boat, affectionately nicknamed the “WallyPop” and took our “tween” children up there for a really fun family experience together. I guess that was a foreshadowing of our love with boating. On Saturday afternoon, we walked around Friday Harbor before Jeannette and Brett took us out to another yummy dinner, this time at the Coho Restaurant. On Sunday morning, the women took a walk around Turn Island while the men circumnavigated the same little island in the dinghy. Because we were running a little late, we used the dinghy to take the Newmans to Friday Harbor for their one-hour seaplane flight back to Seattle. Then it was time to head north to Canada. It was a beautiful, sunny, cloud-watching kind of day. 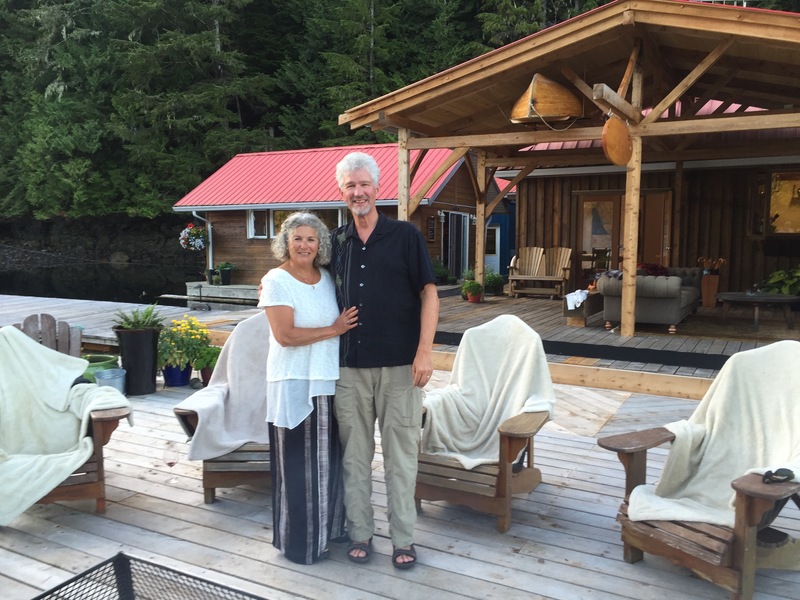 We thought we were going to spend our first night at little Reef Habour (Canadians spell “harbor” with a “ou” instead of an “o”), between Cabbage and Tumbo Islands, just a few miles west of Patos Island, the most northerly island in the San Juans. This was one of our favorite stops at the end of our summer cruise last year. But this year it was too crowded, so we kept cruising north toward Montague Harbour, which is much larger and can always accommodate another boat at anchor. As we were cruising up the west side of the Strait of Georgia, heading for the main entrance (Active Pass) that connects the Strait with the more protected waters of the Southern Gulf Islands, we approached Boat Passage, a much smaller entrance, just as the high-tide slack was occurring (when a rising tide peaks, just before it begins receding). Our reference text told us that this little used entrance to the Southern Gulf Islands was doable during high-tide slack so we decided to look at it and ultimately gave it a try. We made it without bumping into anything, but we completely agree that the only time to use this narrow, winding passage is during a high-tide slack, when the depth is at maximum and there is no current. Montague Harbour is a great place to watch sunset especially if you anchor on the less sheltered northern side of the outer bay. This year we were a little concerned about weather so we anchored in the south side of the inner bay but were still treated to a spectacular golden sunset. Genuine and authentic are our themes for this year. We have been through a great deal since our last summer cruise through Canadian waters on the True Love. As some of you already know, Jim developed an unusual weakness in his left leg last summer, which led us through a nine-month medical odyssey of spinal MRI’s, PET scans, lumbar punctures, a probable diagnosis of spinal cancer, a living-with-cancer mindfulness retreat (that was the transformative “silver lining” to the whole medical odyssey), a last minute trip to Israel (documented in the previous True Love Adventure blog) during which Jim became significantly stronger, which led his radio-oncologist to say it was now very unlikely that Jim ever had spinal cancer. For example, while Jim could barely walk two miles in the spring, he can now walk 6 miles! In fact, we were recently able to do our favorite local hike to Snow Lake (while six months ago Jim couldn’t even do the easy first half of it). While that was going on I have been working to help my amazing sister overcome her addiction to prescription pain meds. We are so proud of her! She is doing everything she needs to do to rebuild her life and return to full mental and physical health. Her journey has also been about being genuine, truthful and authentic. The last year has been about growth, healing, setting boundaries, making important choices and meditation. We now begin our days not with the TV but with fifteen minutes of meditation. Calming healing breath in . . . tension out. It’s an amazing way to start your day! Now that I have a healing husband and sister, I felt free to go north again on our boat and explore. After we made our way to Nanaimo for our annul yummy Greek dinner at Taverna Astera we analyzed the typically cryptic weather forecasts for Johnstone Strait: the narrow, windy passage that is the only way to get to the beautiful Broughton Islands without cruising 200+ miles in the open ocean. Could we get a few days of lighter-than-usual winds to allow us to get through Johnstone Strait to the Broughtons? 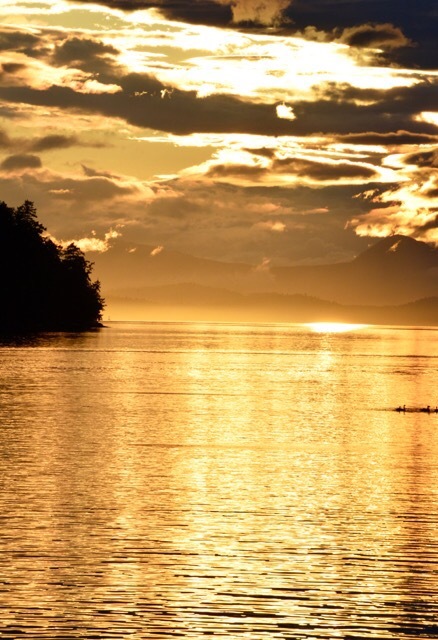 The weather forecast Monday night was for light winds north of Nanaimo on Tuesday and relatively light winds in Johnstone Strait (15 knots) Wednesday morning. It looked like we might have the weather window we needed. Unfortunately, when we awoke Tuesday morning the winds were unusually strong in Nanaimo blowing from the Northwest. It seemed unlikely that the winds farther north were actually “light” as forecast. Undaunted, we headed out of the harbor for the Strait of Georgia (although we made a contingency plan to bailout to another protected anchorage if the weather report was wrong). When we left the dock our fellow boaters were surprised that we would leave the protected harbor with the winds at the dock were already so strong. It was a long 10-hour, 80 mile cruise to Campbell River, but fortunately the winds were relatively calm after we got 20 miles north of Nanaimo, perfectly calm the last 20 miles, and the sun shone brightly almost the entire way! We arrived at Campbell River around 8PM. The main marina at Campbell River was full so we had procured by phone a space at the smaller Fisherman’s Wharf marina to stay for the night. Because of our late arrival, the marina office was closed when we discovered the dock space they assigned to us was impossible to get to without bumping into other boats. So instead we simply docked at another, more accessible dock space amongst the tugboats at the end of the pier and hoped the tug that usually moored there was not coming back in the middle of the night. After a yummy omelet for dinner, we both slept well until our alarm sounded at 4:40 AM to remind us that this was the time we needed to leave to ride the ebb tide north and enjoy the forecast light winds on Johnstone Strait. Across the dock a tugboat captain was readying his boat for a day of work on the water. He liked our boat and wished us well. It felt like a good sign. As the sun rose another boat made its way out of another moorage to join our little procession up Johnstone Strait. We got lucky: the winds were light and the sunrise was peaceful and beautiful. On our way north we spotted the Caper (Gabby and Gillian Barlow’s boat). They were heading south making their way home from Alaska. We hope to make that same journey some day. We talked over the VHF radio, took pictures of their beautiful yacht as it passed and continued on our journey north. Five hours later, around noon, we turned into Havannah Channel and the sheltered channels, inlets and bays of the Broughton Islands. Needless to say, we were pretty tired, so we decided to anchor almost immediately, here at Boughey Bay. We ate a quick lunch, drank a glass of celebratory champagne and then took a well-deserved nap. The rest of the day was warm and beautiful. We read, did our exercises and enjoyed interesting conversations. Jim was reading about the 60th Anniversary of Disneyland and how Walt Disney knew it would never be “complete” because it would always evolve and change. This led me to say that truly iconic businesses or brands have a “soul” that changes, evolves and improves over time. It doesn’t take away from the original idea or the original business. But a truly great business, over time, develops a “soul” that guides it as it continues to grow and achieve its fullest potential in serving its customers, employees and community. The sun sets 30 minutes later this far north (around 9:30 PM during our trip). For dinner I made coleslaw, steak on the grill and roasted peppers. After a well-fought game of chess, we went to sleep only to wake to find a very low tide. We truly had anchored at just the right spot. Twenty yards further back into the head of the bay and we would have been on dry land. Oh well; no contact, no foul! 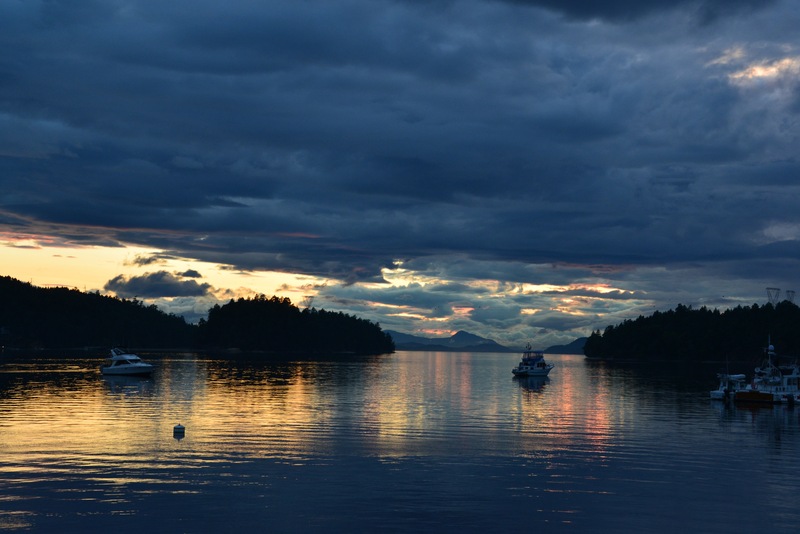 As we head out for our first full day in the Broughton Islands, we can feel ourselves relaxing, and our creative energy renewing, as we surround ourselves with nature’s beauty and the peaceful tranquility of cruising among coastal mountains, through protected channels, fjords and inlets.